Multiple open chat windows on Facebook, bug or feature? We noticed that more than one chat window was staying open for some of us yesterday… this we assumed was a bug due to the way Facebook’s chat used to mess up in the past. We then noticed that all the conversations continued to work as expected. This made us realise that it hadn’t crashed, but had indeed been subtly updated to allow for more than one conversation to be kept open on the screen at one time. Thinking about it, it’s a logical addition as why should you only speak to one person at a time? As a generation we are finding more and more ways to communicate with larger amounts of people simultaneously, so it makes sense for Facebook to let us follow more than one conversation at the same time. It also adds a benefit to some users who are heavy chatters over the mobile Facebook Messenger app when they are near a computer, thus bringing more eyes to Facebook’s ads and generating more revenue for the social behemoth. 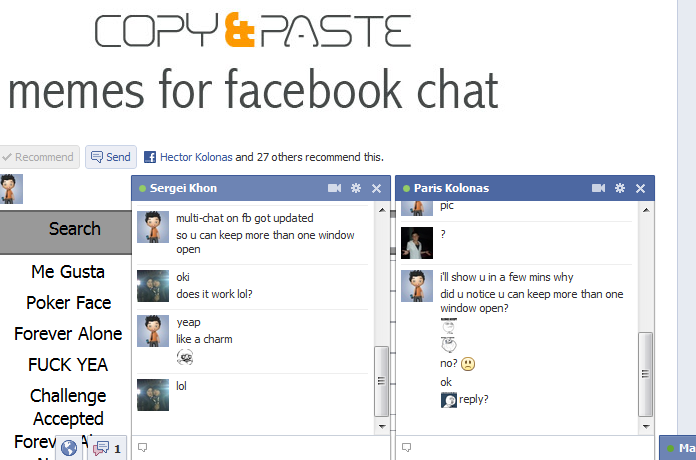 This, and our Copy & Paste Meme app make chatting alot more fun for us on Facebook. What do you think?